What Does “All in” Look Like? This video is with PGC Basketball Directors TJ Rosene and Graham Maxwell. Tj (Head Men’s Basketball Coach) and Graham (Assistant Men’s Basketball Coach) coach at Emmanuel College in Franklin Springs, Georgia. 5) Or anything else that you want to emphasize and get buy in from your players. The video is a You Tube video, so you need to be on a network that does not block You Tube access. A great way to learn about quality coaching is to listen to coaches and athletes talk about the coaching styles they believe are most helpful for achieving success. Coverage of recent sporting events such as the women’s World Cup, and the NBA and NHL finals, provided many opportunities to hear some of the world’s most successful athletes and coaches share their insights on this topic. Whether coaching females or males, and regardless of differences in coaching styles, these championship coaches all share one thing in common: they make building relationships with their athletes a top priority. U.S. women’s national soccer team coach Jill Ellis, who led the American team to their first World Cup championship in 16 years, has been lauded by current and former players alike for her open and honest communication style. Moreover, she places great emphasis on learning how to connect with players in ways that are uniquely meaningful and relevant to each one of them. Chicago Blackhawks coach Joel Quennville has gained the trust of his players, and led them to three ice hockey championships in the past six years, by keeping an open-door policy and showing a genuine interest in listening to his players. Golden State Warriors coach Steve Kerr, in just his first year of coaching the team, built a culture of trust and engagement by making relationship building a regular part of his daily routine en route to the team’s first basketball championship in 40 years. A quote from coach Kerr perhaps best summarizes the emphasis these championship coaches place on relationship building with their athletes: To me, the X’s and O’s … they’re an important part of coaching but a relatively small part. Eighty percent of it is just relationships and atmosphere. Successful coaches have long known that the time and energy invested in building quality relationships with their players pays huge dividends. For example, one of the winningest college football coaches of all time Eddie Robinson proclaimed that showing genuine care for each of his players was the cornerstone of his coaching approach. More recently, Cameron McCormick – longtime coach of the world’s hottest golfer Jordan Spieth – revealed that building quality relationships with athletes was at the top of his the list for becoming a successful coach, based on his study of the world’s best golf coaches. The surest way to show players that you care about them is to ask them about their lives and then give them your undivided attention. Never forget that you are coaching people first, and the sport second. Keep a file for each athlete to record notes about things and people that are meaningful to them. Regularly check in with each athlete and update their ‘life’ file. Some high coaches like to give their athletes a survey to complete at the start of the season, with questions about their dreams, passions, favorite subjects in school, and family. Other coaches find that setting aside a few minutes before practices for ‘social time’ allows them to speak with athletes about their lives while athletes are starting to warm-up. However, for relationship building to work, coaches must also be willing to share information about people and things that are meaningful to them. If you want your athletes to share with you, you must share with them. Ultimately, building relationships with athletes is an act of courage – both for the coach and for the athlete. Each must show the courage to be vulnerable. Coaches show courage, and build relationships, when they create emotionally safe environments. Giving frequent encouragement and helping athletes pull the lessons from performance failures creates an environment where athletes feel safe to risk failure. Ask any championship coach to reflect on what they cherish most from their career and they’ll tell you it was the relationships they built with their athletes along the way. Take a page from the playbooks of the world’s most successful coaches, and set aside time in your daily routine to make a personal connection with each of your athletes. This simple strategy not only leads to better performance, but makes for a more enjoyable and enriching sport experience. This article is adapted from an article on the Human Kinetics “Coach Education Center” website. Click here to read the full article. A short, but very powerful post to share with your athletes. How Will Your Decisions Help or Hurt Your Teammates? You will make better decisions if you focus on how the consequences of your actions affect your teammates. While this is only one criterion which can and should be applied to any decision you make, it is an important one. You begin by asking “What will happen to my teammate(s) if I act upon this decision? Over time, such reflective thinking will become habit. -I should act on this decision. -I should not act on this decision. Using this matrix will not guarantee that your decisions will be good ones. However, the consideration of the consequences of a given decision in terms of one’s self and one’s teammates in the near and distant future should increase the probability that harm to relations and relationships can be avoided. Do you agree with the idea that the best decisions are those that have the most positive consequences for you and your teammate? And that the poorest decisions are those that have the most negative consequences? Give an example to explain your reasoning. How do you know positive consequences will result from your action(s)? Inaction? How do you know negative consequences will result from your action(s)? Inaction? In which of the four quadrants would you find the most “immature” behavior? Why? 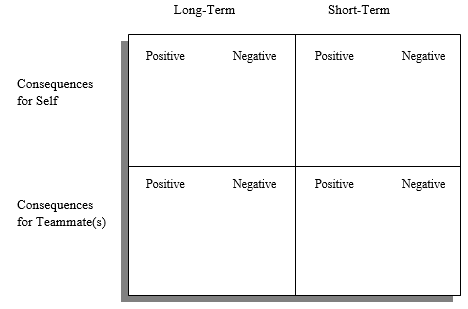 As a team member, how can you use this matrix to help your teammates make better decisions? Dr. Dobbs recently joined Jamy Bechler on the “Success is a Choice” Podcast – hear his thoughts on team leadership and developing a leader in every locker here. Zero Gravity CEO Greg Kristof knows where the future of club basketball is headed and the major role Hudl is playing in the movement. Few individuals are as well-versed in club basketball culture as Greg Kristof. 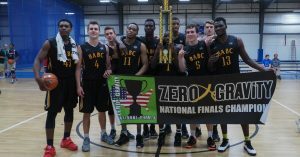 As the CEO of Zero Gravity Basketball, an organization that puts on more than 150 tournaments a year in 19 states, Kristof has seen and heard just about everything clubs do to make their teams stand out and get players recruited. One recent trend has certainly caught his attention — more and more teams are implementing Hudl. It’s now to the point where Kristof can tell which teams are using video to improve and which aren’t. “You can see the difference in the clubs that improve through March and July. They’re the ones that are doing this,” he said. “You can see their improvement over the arc of a season. Teams that we might see four, five, six times during a season, you can see them getting better month by month by having correct coaching feedback. Kristof sees two main ways Hudl is becoming an integral part of the club way of life. First is player development, which is often a tricky task to handle given the severe time constraints coaches have with their athletes. Club teams typically practice just once or twice a week, and the frenzied schedule during tournament play limits the time athletes have to learn. Once players develop and improve, they need a way to get their skills in front of college coaches. Hudl provides simple and efficient tools for athletes and parents to create highlights, catch the eyes of recruiters and create scholarship opportunities. Kristof sees players and parents taking note of which clubs strongly promote their players and which don’t. The clubs and teams with strong development programs, the ones that pump up their players on social media, are the ones attracting top talent. He believes this trend will only get stronger. Don’t fall behind. Ensure your club has the best tools at its disposal and take advantage of Hudl. This pre-season checklist was sent to me by Derek Sheridan, Head Boys Basketball Coach at Delta High School (Ohio). I hope that this can serve to stimulate your thinking and your staff’s thinking about what you need to do to get the most out of your team for the upcoming season. I know for me, putting my thoughts and ideas in document format, and making lists works best for me to flush out and clarify my beliefs, and then turn them into actions. The value in this exercise is what you will plan to do and then execute to play to your strengths and avoid your weaknesses. Just because the worksheet suggests listing 10 does not mean that you should have 10 items for each list. You might want to list 10 possibilities and then trim that number down as you have flushed out the possibilities or as you experiment with them once practice starts and see that some are not a good fit for this year’s team. F. How do we have to play in order to beat the best team in our sectional? 1-4 High 1-4 Low 3-2 2-3 Triangle 2-1-2 4-1 ATO vs.
Editor’s Note from Brian: A good article to modify to fit your needs and share with your players. Coming from a Division I Coach, it will hopefully resonate with your players. This past month has been primarily an evaluation period for those in the college game with two full weeks travelling the country looking for players that best fit our Aggie family. As someone that cares about the game, observing the competition in the summer can by uplifting or disappointing depending upon the team and players you are watching. It’s a lot of pressure on these young women because they know that a summer performance can often preclude their future options. Some players can be found doing too much. At times players can play with the thought of trying to impress a coach and end up over doing it as opposed to doing what their team needs to do to play better. Ironically, helping your team play at a higher level is more impressive to college coaches than individual performance. Truly a lost art. When’s the last time you said to yourself, “that player is excellent as shot and pass fakes.” Of course part of the responsibility belongs to us as a coaches — are we teaching and emphasizing it? Few things can help an offensive player more than the proper use of a pass fake and a shot fake. Sounds a little silly saying “know the plays” but it’s amazing to see a player or two who doesn’t know where they are supposed to be or what they are supposed to being doing. Whether is an inbounds plays, a half-court set, a motion entry or anything else structured, take the time to know where you are supposed to be and what you are supposed to be doing. Next is execution — doing it when you are supposed to and as well as you can. This does not take talent but commitment to knowing and understanding your team’s playbook. Again, seems like it shouldn’t have to be said but it does. And here is the key to playing hard — you have to do it all the time…not just when your team’s ahead or the play is called for you. Playing hard means that you are making all your cuts in your offense hard. It means that you are sprinting to screen. It means that getting back on defense is a full speed proposition. Be the player constantly encouraging their teammates…picking them up both physically and emotionally when the time comes. Don’t be the player with the horrific body language when a teammate turns the ball over as if you were saying “I wouldn’t have made that mistake.” If a played does make a mistake, correct it is a positive manner. Forcing shots does not help your team nor does it impress a college coach. Know what a good shot is for you — and yes, your shot selection will vary from those of your teammates. Don’t hunt shots, let the shots find you. As I heard Nick Saban once say, “Wherever your shoes are, be there.” Don’t wonder mentally. Stay focused to the job at hand. Be a process oriented player. Don’t worry about the past play — it’s over. Don’t worry about a play in the future they may or may not happen. All you can control is the current possession you are involved with — give the possession complete concentration. This actually can do a long way to helping with concentration. In timeouts are you locked in with your eyes and ears. Does you coach have your complete attention. There’s a free throw situation and your coach or captain is barking out instructions. Are you actually listening and processing or just hearing — and there is a difference between listening and hearing. Without doing anything in regard to skill work…without saying anything about your talent level…you can make an impact on your team by being in great physical shape. When the game is in the fourth quarter or late int he second half and everyone else is starting to drag, this is where you can make a difference. Not only will you be a step faster because of your conditioning level, but you will be mentally sharper as well. How many times have we seen a team put on a late run and in large part because of players that are in just better shape that run the floor and past their opponent. Again, these have nothing to do with skill or talent but they are game changers. The three areas that players can control (but often choose not to) are: attitude, energy, enthusiasm. Now I’m not saying it is easy but if you want to make a difference in your team its well work working on. By controlling your intangibles, I mean you don’t let officiating, teammates, opponents, coaches, gym conditions or anything else effect you having a team-first attitude, with high energy and positive enthusiasm. What do your teammates see when they see or think of you? He or she is always early to the gym. They stay late. They are on time for meetings. They listen to the coach. They keep their composure. Off the court they conducting themselves the right way. They maintain a proper diet to put fuel in the tank. They are positive talkers — not criticizing a coach or gossiping about a teammate. Some of the best rebounders are lacking in talent and athleticism — they board well because of effort and tenacity. Rebounding is one of the only areas in basketball where it’s alright to selfish. I’ve coached for over 35 years and have never heard of a coach taking a player out for rebounding too much! I would imagine some of my coaching friends can add to this list but the key for players to understand is that every player can adopt these principles and it will make them a better player and their team a better team. There’s nothing on here that requires you to jump higher, run faster or have an amazing handle. Be committed to areas that you can control and work towards being the best you can in those areas.